Is your cat being naughty? Send him packing in this suitcase-turned-pet-bed! 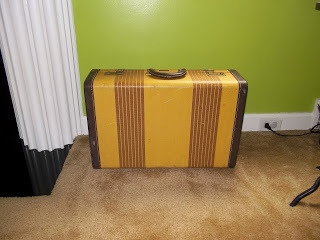 Suppose you like to cruise Ebay for vintage suitcases, as pretty much everyone does (No? Just me?). Well, I found this beauty and knew it would work as a bed for the alpha cat in our household, Mr. Fudge John Lickins III, Esq. (not sure where he found the time to get that law degree…). You see, Mr. Lickins (aka Fudgey) has been feeling a bit down since we adopted a dog. I thought a new bed might cheer him up. Besides, he’d been sleeping in a blanket-filled cardboard box, which didn’t contribute much to the design aesthetic of my living room. Enter the suitcase-turned-pet-bed! I will not claim credit for this idea. 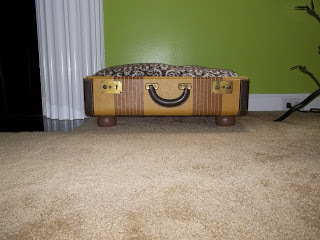 I’d been seeing versions of suitcases, and small tables, turned into pet beds around Ye Olde Internet for awhile now. I’d been waiting to create my own version. I read several instructions for this project that involved sewing a special cushion (I don’t sew) and installing a couple of cut 2x4s into the bottom of the case to serve as a solid base to screw in the furniture legs. This sounded like an awful lot of work. My lazy-woman’s version took hardly any time at all. I simply removed the top of the suitcase (I have young children who may have taken great delight in closing the cat in had I left the top attached). I found a couple small throw pillows in a closet and wrapped a spare piece of pretty flannel fabric around them for a cushy nap spot. For the bed’s legs, I purchased four bun feet from Lowes and painted them dark brown. The suitcase is made of fabric covered cardboard, so I just made pilot holes with a screwdriver and mallet and then screwed the threaded feet into the holes. 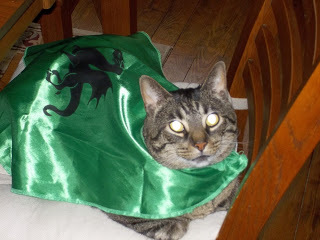 Of course, I could not convince Mr. Lickins to lie in the bed for a photo, so here he is, fully rested from a night in the bed, and ready to fight dragons (alas, he’s not finding much work in the legal field).